The biggest problem for Republicans these days is that their 2016 presidential candidate is not a Republican. He is by name, of course; Donald Trump’s name is on the GOP ticket. But Trump apparently has little understanding of or regard for the principles of civility and decency, cooperation and respect, dialogue and compromise, ethical leadership and responsibility, temperance and self-sacrifice on behalf of ‘we the people’ – in other words, little understanding or regard for the foundations of liberal democracy. As the circus approaches election day, even Republicans are offended and embarrassed, poised now to renounce their candidate in the interest of our nation’s future. How did he get this far? How was it possible that a dozen or so much more qualified contenders got pushed off the stage – a few of them viciously maligned and forced (or so it must have felt) into some mud-slinging of their own? A few reputations and political prospects were not only injured but maybe even permanently wrecked in the fray. In evolution there is a force at work that Darwin named ‘natural selection’, which has to do with the ongoing necessity of living things to maintain their ‘fitness’ in the interest of survival and reproduction. A later proponent of evolutionary biology, Herbert Spencer, coined this idea into the phrase “survival of the fittest,” referring not simply to the strongest and most aggressive individuals who can bully their rivals and out-compete for females, but to any organism that can successfully adapt to its environment and find a provident niche where it can thrive. By putting this requirement on living things, nature has raised a gradient against the likelihood that genetic mutations and individual deviance will survive and reproduce, unless it can win this struggle for fitness. In economics there is another force, which the Scottish philosopher Adam Smith saw at work in free-market capitalism, where rational self-interest and competition in business conspire toward ‘the wealth of nations’. As individuals and industries compete with each other for market share, the cost value ratio of what they offer to consumers keeps the quality of their goods or services from slipping out of favor. This is another kind of selection, and fitness here allows a commercial enterprise to survive and maybe spawn a new generation of innovations. Smith wasn’t praising selfishness in business but rather an interest in building one’s own competitive edge in delivering genuine value. And in politics there is yet another force, which in liberal democracy has been called ‘the will of the people’ or ‘the general will’. The idea here is that the collective effect of individuals voicing and voting for what they want is a clarified expression of what is best for the body politic. In representative government the people elect officials who carry the responsibility of defending and promoting the majority interest of their constituencies. Not everyone gets what they want, but a broad base of shared value is eventually established where the security, freedom, and each individual’s pursuit of happiness can (at least in theory) be protected. 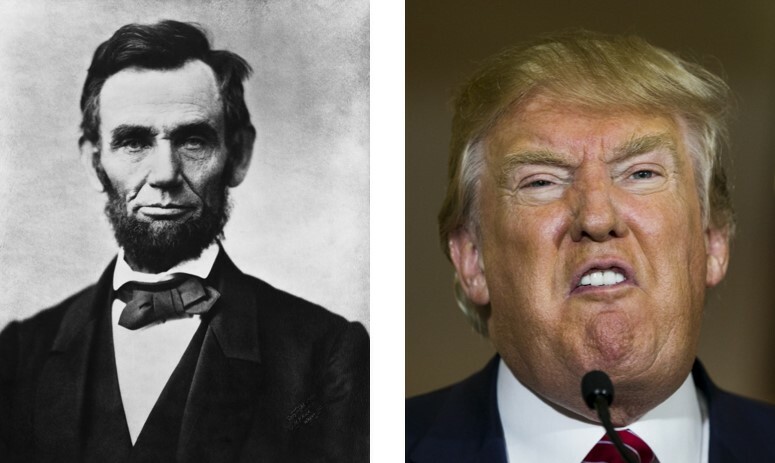 Now over many decades the Republican Party has been steadily undergoing a transformation of character, from the republic-defending, ethically centered, and unifying efforts of Abraham Lincoln, to what we have in Donald Trump. (Just put those two individuals side-by-side in your mind for a moment and you should start to feel the twisting vortex of cognitive dissonance.) Along the way, the Grand Ole Party sidled up to various special interest groups, some endeavoring to forward a few constitutional rights that are more period-specific than they want to admit (like the right to bear arms against the encroachments of a hostile government), and others seeking to bind our nation to a religious orthodoxy that historically has condemned the advances of science, the liberalization of morality, the creative authority of individuals, and the rise of inclusive community. There is a deep underground reservoir of repressed insecurity, resentment, and bigotry in our national unconscious, which has been kept below a thin threshold of civility – at various times not so successfully. As things progressed for liberal democracy, many of these inner demons made their way into legislation while others got projected onto whatever scapegoats we could find. Unfortunately this repressed shadow attached itself to the Republican Party, altering the platform from a philosophical avant-garde for individual freedom and social responsibility, to something just short (maybe) of institutionalized racism and bully politics. This is not Lincoln’s party, and it’s not what Americans aspire to be. My theory is that this mysterious force called ‘the will of the people’ orchestrated the steady elimination of worthy GOP candidates and left us with this one very crass and blatantly bigoted contender for the presidency, for the purpose (not conscious, mind you) of pushing the Republican Party into extinction. If there is to be a resurrection at some point, Republicans will need to get their house in order.